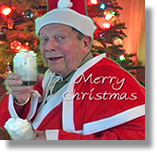 Brand new Christmas DVD - Yust Go Nuts at Christmas - Featuring holiday songs and laughs. Stan Boreson Tickles the funny bone... of both the young and the young at heart. Please browse around, you'll find the tidbits about Stan's background and how he started his career, sound bites of some of his songs, lists of songs on different albums/CD's, and even be able to order a CD if you like! Site Designed By Pac Services, Inc.